In Enrique Vila-Matas' El viaje vertical, the septuagenarian protagonist, Federico Mayol, a self-made insurance company magnate who loves Port wine, goes on a "vertical" journey towards solitude and senility. After being thrown out of his house in Barcelona by his wife, Mayol heads to Portugal and the rock of Madeira. There, he begins the education ("culture without discipline") that was denied to him by the Spanish Civil War and eventually meets his end. By happenstance, I was reading this novel on the same weekend I held Whine On The Rock's first ever vertical tasting, courtesy of Cousin #5 who needed our assistance emptying his wine fridge to make space for more than 120 bottles soon to be docking on The Rock from France's Southern Rhone. He provided our tasting team with four bottles of Domaine Vlassides Cabernet Sauvignon (2006, 2005, 2004 and 2002 vintages), while Radio Free Cyprus prepared some barbecue ribs, lamb kofte kebab, spicy beef sausages and grilled vegetables as part of his first BBQ seminar on how to handle gas grills without burning one's eyelashes or getting high on propane. 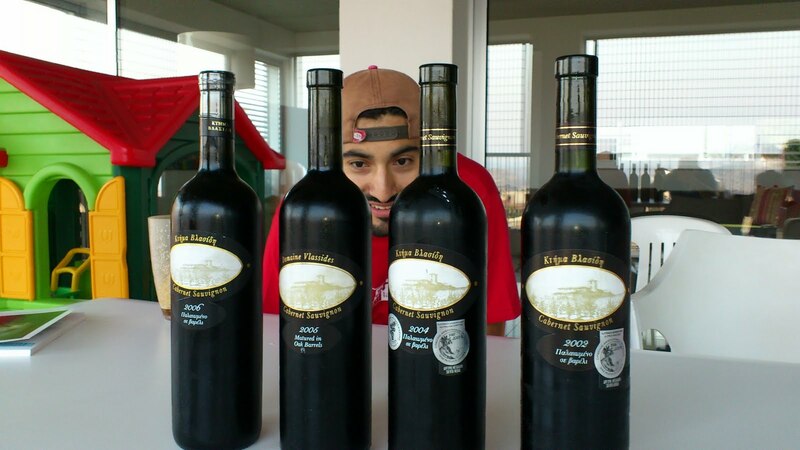 Like Mayol, wine has a lifespan. At an early age, a good bottle can be fresh, vibrant and playful. Sometimes it's naive or shy or just Plain Jane. As time transpires, though, good wine reaches its apogee as a mature, refined and complex creature that is full of nuance and mystery. Then it begins a slow decline in which it is emptied of substance and style and grows sour like vinegar and waits for the day to be put to rest down a kitchen sink. Lucky for us, the Domaine Vlassides Cabernet Sauvignon vintages we tasted that evening performed admirably. 2006 Domaine Vlassides Cabernet Sauvignon - Blackberry, vanilla, spice and smoke on the nose. Very smooth and balanced, medium body. Fruitiest, biggest and jammiest of the night, probably a result of its age. Average Score: 84/100. 2005 Domaine Vlassides Cabernet Sauvignon -Very tight nose. Short and empty. Cousin #5 and I decided this wine was completely closed and set it aside for two hours. When we came back to it, it had opened up quite nicely. Notes of plums, blackberry and vanilla. This vintage definitely requires decanting. Average Score: 77/100. 2004 Domaine Vlassides Cabernet Sauvignon - An explosion of black pepper on the nose with hints of wild forest fruit and chocolate. Much longer and with a better tannic structure than the previous vintages. Average Score: 82/100. 2002 Domaine Vlassides Cabernet Sauvignon - Red fruit, caramel, smoke and leather on the nose. Best wine of the bunch. Balanced and quite round. Cousin #5 was blown away and awarded it a 93 out of 100. Radio Free Cyprus, guilty of pulling all of the average scores down several notches, gave it an (in my opinion unwarranted) 84. Average score: 89/100. "Dejándose llevar por su excepcional capacidad para hundirse, sintió que él era la Atlántida misma y que, en el breve tiempo de una noche,...iniciaba su último descenso y, en una inmersión muy vertical, se hundía en su propio vértigo y llegaba al país donde las cosas no tienen nombre y donde no hay dioses, no hay hombres, no hay mundo, sólo el abismo del fondo." After the four bottles and officially tipsy, our wine-fridge-emptying services stuttered to an end. We drank a bottle of the 2002 Chateau Les Moines Cru Bourgeois from Medoc, a lovely wine with hints of green beans (fasolaki represent! ), green pepper, raspberry, broccoli, chocolate, coffee, licorice and top soil, and then a few shots of ETKO's Centurion Commandaria, a complex fortified dessert wine from Cyprus, that hid in its dark amber color flavors of dried apricots and raisins, butterscotch, coffee, milk chocolate, maple and carob syrup, walnuts and almond paste. Unfortunately, somewhere in between, we had a shot of an Armenian pomegranate wine that stank like cheap Chinese wood and tasted like pomegranate concentrate. Cousin # 5's wife, Our Furniture Fairy, who dedicates her professional life to importing furniture from Italy, wholeheartedly agreed, and then, in our drunken stupor, we all wondered out loud whether or not it would make a good marinade for grilled pork chops. In retrospect, I vote for it to meet its Maker. Thank you for such an interesting and entertaining post. As a testament to the educational value of blogs, your blog encouraged me to familiarize myself with numerous terms and concepts which I am sure you, through "direct" experience, have come to master. Thanks for your comment. Wine is a wonderful hobby, except for one's liver. So, happy drinking, and keep the comments coming!